US court rulings put future of video servers in doubt | What Hi-Fi? In both cases, makers of storage software and hardware were battling injunctions against them demanded by the big movie studios; in both, the courts found in favour of the studios. On Tuesday, RealNetworks suffered a setback when the US District Court for Northern California issued an injunction stopping sales of its RealDVD software and a planned DVD-copying set-top box. Sales of Real DVD were halted after just a few days last October in response to a lawsuit lodged by the movie studios, alleging violations of the Digital Millenium Copyright Act and the terms of the Content Scramble System (CSS) licence held by Real. At that time judge Marilyn Hall Patel issued a temporary restraining order prohibiting sales; on Tuesday, she formalised that into a preliminary injunction, indicating that Real was likely to lose the case brought by the studios. The injunction also indicates the judge's belief that the studios would suffer "irreperable harm" if RealDVD was put back on sale. The heart of the case against RealNetworks is that the technology doesn't limit the number of people able to copy a single disc, and neither does it stop users renting discs, ripping them to their servers and then returning them. 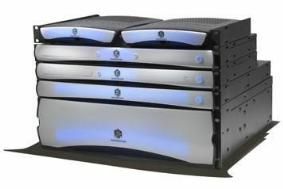 Yesterday another California court dealt the home movie server business a further blow, when the state's Six Circuit Court of Appeal threw out a previous ruling in favour of Kaleidescape, maker of high-end home entertainment servers. In 2007 the company had emerged victorious from a case brought by the DVD Copy Control Association, but the appeal court overturned that ruling, and is now to rule whether Kaleidescape is in breach of its agreement with the DVD CCA. For now, Kaleidescape products (pictured above) are legal and remain on sale, but the outcome of the further ruling could change all that. Not surprisingly, the company has already indicated it's likely to appeal to the California Supreme Court. However, all isn't gloomy for those of us wanting instant access to our movies: a recent licencing agreement approved by the Advanced Access Content System License Administrator, which licenses Blu-ray's AACS copy protection, will from next year require studios to give consumers the ability to make one full-resolution copy of a purchased Blu-ray Disc. That means almost all Blu-ray discs released after the first quarter of 2010 will allow one backup copy, to recordable Blu-ray or DVD discs. as a download to a Windows Media DRM-compatible portable player or hard drive, or to memory cards. Studios can, however, choose to charge consumers for permission to make the initial backup copy, and could also make additional copies possible for a further charge.